How can chain conveyors help your business? Chain conveyors are primarily used to move heavy duty items within a factory or warehouse environment. They have the ability to handle large units such as pallets or containers. Andrews Automation offer a wide range of chain conveyors with endless application possibilities. They can be designed and manufactured to exact specifications and installed in a number of different environments including the cold storage, warehousing, food production and many more. Typical Chain conveyors work by utilising the power of a continuous chain arrangement which is driven by a motor. The materials on the chain conveyors are suspended on pendants as they are conveyed. Chain conveyors come into their own when transporting heavy unit loads such as boxes, pallets or industrial containers. The load is positioned on the chains and the friction pulls the load forward. 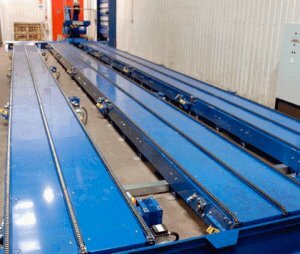 Chain conveyors are generally easy to install so minimal disruption is caused to the rest of the workplace. They are also easy to maintain so can be attractive to businesses who require minimal downtime as their lines run 24 hours a day. Andrews Automation also offer an innovative new chain conveyor called the Deniway plate Conveyor. This is a new simple, robust and reliable chain conveyor. Due to its design it is subject to less wear and therefore increasing its productivity and reducing the need for it to be maintained on such a regular basis.